Fabio has been part of the Nedbank world for the last 10 years specialising in the execution and implementation of strategic Programmes. During his time at the bank, he has been involved in many firsts from launching South Africa's first cash accepting ATM to the latest endeavour, the unveiling of Pepper, the first commercial humanoid robot in South Africa. 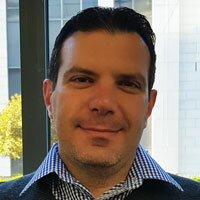 Fabio has been intimately involved with the Nedbank Retail front line channels and has been a key enabler in the journey from standalone channels into the world of Multi- and Omni-channel ecosystems as well as overall management for operational, innovation and organisational initiatives for channel business. In recent times, Fabio has recently taken additional accountability for understanding and managing the effective change management of solutions landing in the business. He currently heads up the Projects, Change and Strategic Execution team for Nedbank Integrated Channels and holds a degree in Electronic Engineering, a honours in Technology Management and Masters in Project Management. Nedbank has taken the leap in exploring humanoid robotics through the launch of Softbank's Pepper. Tough lessons learnt in launching South Africa first humanoid robot. DFA finances, builds, installs, manages, and maintains a world-class fibre network to transmit metro and long-haul telecommunications traffic in South Africa. We started rolling out our network in South African cities during October 2007 and have rolled out in excess of 10,000 km of fibre route, which we manage and operate with an uptime of 99.99%. DFA leases secure transmission and backbone fibre infrastructure and provides associated carrier-grade connectivity services to telecommunications operators, Internet service providers, media conglomerates, tertiary education institutions, municipalities, government organizations, and other businesses, large and small, on equal terms. Dotmodus holds a Google Cloud Specialisation in Data Analytics and has been a Google partner since 2010. Our core areas include Data Analytics, Infrastructure, Machine Learning and App Development.Our Specialist Areas include Rapid Cloud Data Warehouse and Data Lakes & Machine Learning Model building and testing. We work with Google Cloud ML, Tensorflow, Google Bigquery, Google Cloud Dataflow & Google Pub-Sub. Our aim is to help customers build their digital goals on Google Cloud Platform. We do all of this on a large scale and we do it fast.